How long these beautiful, natural-looking restorations last depends on how well you take care of them. The porcelain itself wears as well or better than your natural teeth. With the newest advancements in dental adhesives the bond between your veneers and natural teeth is very strong. Though the porcelain veneer itself cannot decay, the uncovered part of the tooth adjacent to the veneer is still susceptible to decay, so you can still get cavities with veneers. If you take excellent care of your teeth with proper home care, diet and regular preventive visits to your dentist, your veneers will last many years. It is best not to think of your veneers as permanent but think of them lasting fifteen to twenty-five years if properly maintained. Except for a few special considerations, you should care for porcelain veneers as you would your natural teeth with daily brushing and flossing. The goal is to remove plaque, the soft sticky film made up of saliva, food particles and bacteria that attaches to your teeth. The bacteria in plaque produce intraoral acids attacking tooth enamel which cause cavities. Plaque also causes gingivitis, a gum inflammation, and if left on teeth long enough will turn into tartar build up. Tartar can cause periodontal (gum) disease and can’t be brushed away but must be removed professionally by a dental hygienist. The selection of the appropriate toothpaste is important. Some brands of toothpaste have harmful abrasives that can scratch the highly polished surface of your veneers making them appear dull. These brands are designed to remove surface stains to make your teeth appear whiter but can damage the porcelain surface. These toothpastes can sometimes be marketed as whitening toothpastes. Avoid any toothpaste with baking soda as it is a form of abrasive. Supersmile, a brand of toothpaste specifically designed to be used with cosmetic dental work is gentle and an effective cleaner. Your choice of toothbrush is also important. A manual toothbrush should have soft bristles, as they have been proven to be just as effective for removing plaque and light stains as mild or firm bristle brushes. The firmer the bristles the greater likelihood you will damage the thin layer of gum around the neck of your teeth. If the gums recede in this area the root of the natural tooth and the edge of the veneer may be exposed. Though perfectly healthy some find the shade differential between the veneer and root surface to be unesthetic, if visible upon smiling. The proper technique while using a manual toothbrush, will ensure maximum plaque removal without damaging your gums. The bristles should be placed at a 45 degree angle to the surface of the tooth using a circular motion. Avoid using a back and forth motion in one direction as this will most likely result in damage to your gums over time and gum recession. Also use vertical strokes away from your gums to reach the areas in between your teeth. Using an electric toothbrush with soft bristles is highly recommended as the pressure you exert while brushing your teeth is better controlled. This means effective cleaning of your teeth and veneers but less pressure on your gums. 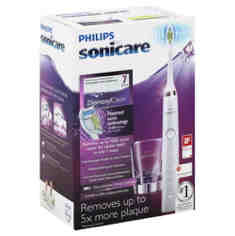 Sonicare by Phillips is a popular brand sold in retail locations and many dental offices. Studies show that its sonic vibrating action of the bristles can remove up to 100% more plaque than a manual toothbrush. Regardless of the type of toothbrush used don’t get in a hurry. Two minutes should do it. Be sure to develop a routine for covering your entire mouth. For example, start with the upper left back teeth on the outside and work your way towards the front of the mouth and then all the way to the back right side. Now flip your brush to the inside back right working your way to the front inside and then all the way to the back left inside. Repeat the same technique for the lower teeth. Dental floss is recommended to be used daily to maintain and clean the edges of your veneers in between your teeth. Regular waxed nylon dental floss is an effective cleaner but may be difficult to slide in between tight contacts because of the added thickness of wax. Unwaxed nylon floss is easier to slide between your teeth but is prone to shredding. The best choice is polytetrafluroethylene floss (PTFE), the same material used in high-tech Gore-Tex fabric. This floss slides between your teeth easily and is less likely to shred than regular nylon floss. 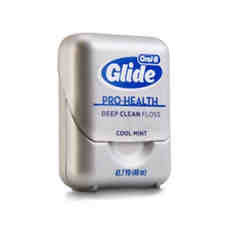 Glide Pro Health (Oral B) is a popular brand of PTFE floss. Proper technique is important in using dental floss. Don’t just snap the floss up and down in between the teeth because this doesn’t clean the proximal (side) surfaces of your teeth properly. Place the floss in between your teeth and gently snap it through the contact. Now wrap the floss around the side of one tooth forming a C-shape. Using a gentle up and down motion scrape the side of the tooth being sure to go under the gums where plaque may not be visible. Now without removing the floss from in between your teeth, slide the floss over to the adjacent tooth and repeat the process. Remember when you place floss in between your teeth you actually clean the surfaces of two different teeth. Many people like to use a mouthwash because it makes their mouth feel fresh. Though not a substitute for brushing and flossing, using a fluoride mouthwash can provide some extra benefit. Be sure to use a non-alcohol rinse since alcohol can actually dry your mouth out reducing salivary flow. Important functions of saliva are to wash plaque and bacteria off of your teeth and buffer the acidity produced by bacteria. Salivary enzymes help neutralize the low ph (acidity) in your mouth that may lead to cavity formation. Some people who have dry mouth chew gum or mints to stimulate saliva, but be careful as many forms of gum and mints contain sugar which can harm your teeth. Sugarless gum and mints containing xylitol have antimicrobial properties are safe to use and as a bonus, they’ve actually been proven to reduce cavities. Biotene Oral rinse is an effective product for people with dry mouth due to aging, medication or radiation therapy. Regular check-ups and cleaning is recommended at least twice a year to maintain the health of your natural teeth and ensure the longevity of any dental restorations including porcelain veneers. Though the dentist will periodically check your teeth and veneers, the dental professional most trained in preventive practices is the dental hygienist. The dental hygienist should be trained on the special maintenance techniques used to maximize the lifespan of porcelain veneers. Regular polishing paste used to clean natural teeth by the dental hygienist should not be used on porcelain veneers as they may be too abrasive. Special less abrasive brand of polishing paste designed for porcelain is recommended. Shimmer by Nupro is an effective brand for professionally polishing porcelain surfaces. The dental hygienist should take care when cleaning with hand instruments, such as a scaler, to remove tartar buildup on a tooth surface adjacent to the edge of a veneer as to not chip the porcelain. Also, care should be used by the dental hygienist when using an ultrasonic cleaner in this area. The ultrasonic scaler uses a vibrating metal tip with a water spray to dislodge tartar build- up but could chip porcelain if not used judiciously. The edge of the porcelain veneer where it meets the natural tooth is called the margin. This area is the most likely to pick up stains or form a cavity (decay). The margin of the porcelain veneer should fit flush with the natural tooth as to not to trap stains or plaque. If you notice stain or roughness in the margin area, bring it to the attention of your dental hygienist. Also if floss shred or snags it could mean there is excessive adhesive or excess porcelain at the margins that should be clean and smoothed. Puffy or red swollen gums after placement of porcelain veneers is a sign that something is amiss. Something is irritating your gums and should be checked by your cosmetic dentist. In many cases, a properly fitting porcelain veneer can actually improve gum health. The application of a fluoride varnish, especially in the margin area, after professional cleaning and polishing is highly recommended. Be sure your dental hygienist uses a fluoride varnish and not a prescription fluoride rinse after your cleaning. Fluoride varnish, a newer development in fluoride application, is much more effective in preventing cavities than fluoride rinse when used immediately after cleaning. 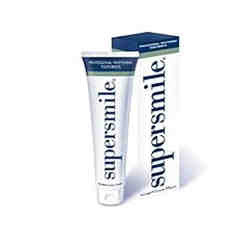 Though Supersmile toothpaste is safe and effective for porcelain veneers, your cosmetic dentist may recommend a prescription strength fluoride toothpaste for daily home care, such as Prevident 5000 by Colgate, especially if you’re prone to cavities, have root exposed teeth or have many dental restorations such as porcelain veneers. 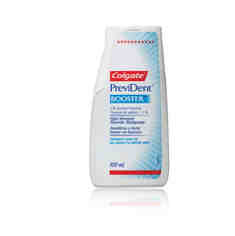 This toothpaste can’t be bought over the counter but by prescription only at a retail pharmacy or at your dental office. Any topical application of fluoride helps prevent the demineralization of tooth surfaces (the precursor for cavity formation) and is bacteriostatic (prevents the growth of bacteria in plaque). The food you eat and the liquids you drink can have a huge impact on the health of your teeth and the longevity of dental restorations such as porcelain veneers. Of course, almost everyone knows that candy has tons of sugar and is bad for your teeth. Many processed foods also have high sugar content so be sure to read labels. Some patients, who assume that their diet is healthy, are shocked to find out their diet is putting their teeth at risk for dental cavities (decay). You should avoid highly acidity and sugar-laden food and drink especially in combination with one another. Repeatedly exposing your teeth to highly acidic foods and drink can damage the enamel of your teeth by demineralizing the surface. Sugary foods and drinks are like adding fuel to the fire for cavity formation. Sodas have the dangerous combination of high acidity and high sugar content. Not only are sodas bad for your overall health they are bad for your teeth. It is recommended that you eliminate or limit soda intake in your diet. If you do drink a soda remember to brush afterwards. Many fruits and fruit juices are highly acidic and have high sugar content. Not that you should avoid fruit because it is a healthy food group, but if you consume fruit be sure to brush afterward to remove any acidic liquids and sugar left on your teeth. Fruit juices are highly concentrated acidic washes with high sugar content and should be drunk on a limited basis. Studies also show that ingestion of too much fruit juice, as well as soda, can produce an unhealthy insulin response that creates an unstable level of glucose in your bloodstream stressing the body. Drink in moderation and be sure to brush after drinking fruit juices. Part of being healthy is getting regular exercise. Many people consume sports drinks during and after exercising to refuel their body. Many are surprised to learn that what they thought was a healthy activity is actually putting their teeth as a risk to cavities. Many sports drinks are also highly acidic and have high sugar content. Some of the more popular sports drinks are Gatorade, Powerade, Accelerade and Propel Fitness Water. Energy drinks have become wildly popular but many are also highly acidic and high sugar content putting your teeth at risk. Some of the more popular brands include Red Bull, Full Throttle, Vault and Monster. Battery acid has a ph of 1.0, the most acidic. Water has a neutral ph of 7.0. Many of these processed drinks have a ph of 2.4-4.0 making them highly acidic. Even heart-healthy red wine, an alcohol-based fruit juice is acidic! Besides sodas, sports drinks, and energy drinks what other drinks may put your teeth at risk? Fruit Smoothies, coffee house drinks, and sweet tea can be loaded with sugar. So maybe you’re thinking now thinking what is safe to drink? What about water? It has a neutral ph and no sugar! If you do ingest drinks or foods with high sugar and/or acid content just be sure to limit your servings per day and brush and floss afterward. Moderation and good home care is the key to preventing cavities no matter what food and drink are in your diet. Dry mouth is another concern for cavity formation. Since saliva has properties that protect your teeth from cavities, reduced salivary flow will put your teeth at risk. Therapeutic radiation in the head and neck area can diminish or completely inactive your salivary glands put you at risk for significant cavity formation. Patients must be vigilant about protecting their at-risk teeth with more frequent check-ups, use fluoride products, diet modification and drinking fluids as salvia substitutes. Though salivary flow is somewhat reduced with age, oral medication can greatly influence the productivity of our salivary. Almost all medications have some side effects and one of the most common is dry mouth. If suffering from dry mouth, inform your doctor about the side effects and ask if there can be a modification to the actual medication or dosage to improve salivary flow. If taking medication is not possible, be sure to practice good home care along with diet modification, fluoride products and consider have more frequent dental cleanings to protect your teeth from decay. Besides protecting your veneers from new cavities, you’ll want to prevent chipping or breaking your new veneers. Though your veneers are very strong and durable, there are certain precautions you should take to preserve them. Your front teeth are naturally designed to tear food and your back teeth designed to actually crush and chew food. You do not want to tear or chew hard foods with your natural teeth or porcelain veneers. Hard candy, granola and hard bread like croutons or pizza crust should be eaten with caution. Also, your teeth and new veneers are not tools and should not be used to open packaging, bite on fishing lures, bite your nails etc. Also be aware of harmful habits like chewing on pens, bobby pins or any hard object can damage your teeth or veneers. If you enjoy participating in any sports, even non-contact, consider wearing a sports mouth guard. You never know when you’ll accidentally be hit with a ball or competitor and damage your teeth or beautiful new veneers. Generic mouth guards can be purchased at sporting goods stores. The types that can be softened by boiling in hot water and manually molded to your teeth can be effective. For maximum protection consider a professionally made sports guard fabricated by your dentist. Many times people we seek to have treatment with porcelain veneers because their teeth have worn down over time. If you wore your natural teeth down from grinding or bruxing you need to protect your teeth. You will not suddenly stop grinding so protecting your new veneers from chipping or breakage is important. Though you can be aware of grinding your teeth during the day, your cosmetic dentist should make you a custom made night guard for you to wear at night while you sleep. Most people grind their teeth at night while asleep. The night guard can be a simple lightweight appliance for someone who occasionally grinds their teeth to a durable lab processed appliance for someone who grinds heavily for maximum protection. Limit sugary and/or acids drinks including fruit juices, sports drinks, energy drinks, fruit smoothies, coffee house drinks, sweetened teas and wine. Consider a mouth guard if you participate in sports even non-contact. If you grind your teeth have your dentist make you a night guard for protection while you’re asleep.